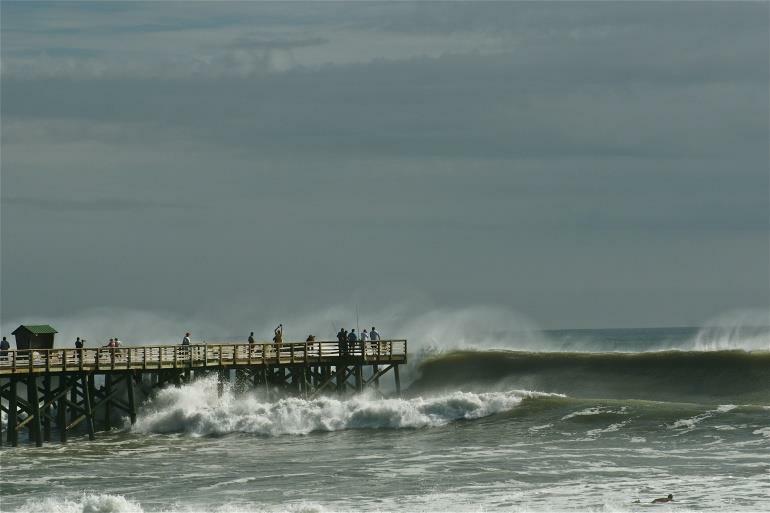 A pic I stole from someone on FaceBook of a largish day at the pier at Flagler Beach. One of my favorite spots after I moved from South Florida -- straight across the state from Steinhatchee, waves were frequently quite decent and almost always uncrowded. It was also a day much like this one that I almost drowned, oh, maybe fifteen years or so back. I posted an early draft short story (title, oh so originally, 'Surf') based on the experience on line several years back. Since rewritten to include more of the psychology aspect, though I usually prefer to let actions speak and keep internal dialog to a minimum. Maybe someday I'll try to place this version somewhere or anthologize it or incorporate it into a novel, even. It's been a while and at this point the story I wrote is actually clearer in my mind than the incident itself! One thing though, there was a definite feeling of accomplishment and even exhilaration when I made it to the beach that day. I could have ended right there...and would it have made any difference? I don't know; we all go sometime, after all, and I've been in other life-threatening situations (but drowning is definitely NOT the way I'd want to go!). Gee, I've had some exciting times for a little low-key sort of guy. And I think I need more of them. I get depressed when I'm bored and the every-day-the-same grind of being a caregiver lately has not exactly helped. Oh well, things inevitably change. Sometimes even for the better.